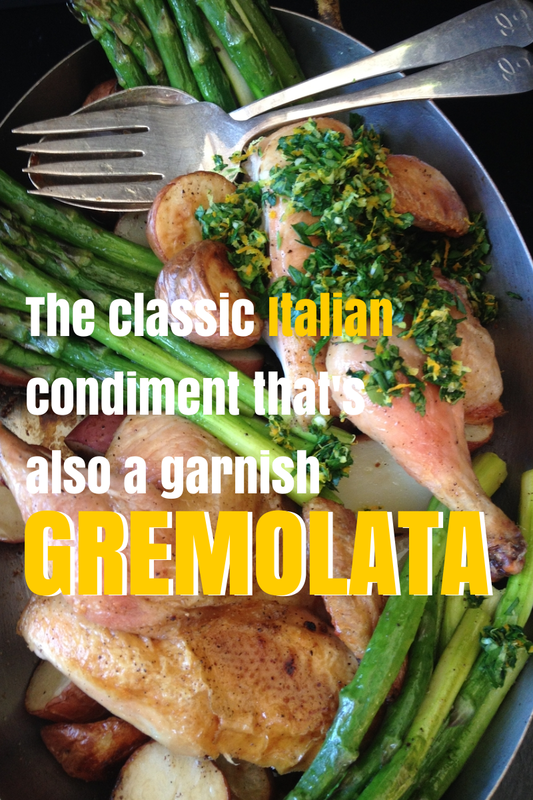 Gremolata is the classic garnish for Ossobuco Milanese the braised Milanese veal shank dish. It’s an Italian condiment that’s traditionally made with minced garlic, lemon zest, and minced parsley. Think of it as a condiment that’s also a garnish. Don’t let the simple ingredients fool you… The tangy zest and refreshing parsley when combined with the bite of raw garlic enhances just about everything you pair it. We don’t think it should be reserved for just ossobuco and use it often to brighten up the flavors of boring weeknight meals. 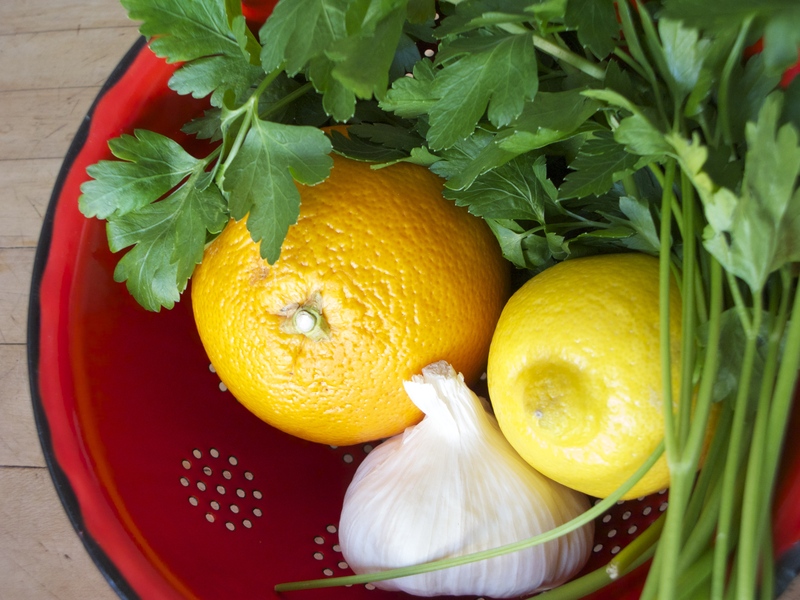 A classic gremolata calls for garlic, lemon, and parsley. We added orange zest to ours to personalize it, but that’s optional. Italian cooks are legendary for adding secret ingredients to personalize a classic sauce and turn it into their signature sauce. Try adding a teaspoon of chopped capers, a pinch of cayenne, or anchovy paste for variety or come up with your own twist. Mix the zest, garlic, and parsley in a small bowl. Season with salt and pepper. Garnish your dish with gremolata just before serving for the freshest flavor. Don’t skip washing and drying citrus (we use a paper towel to dry.) When using citrus for zest it is important to start with clean fruit. Washing the fruit removes dust and the wax used to keep the fruit looking shiny and fresh. If you can afford organic fruit even better. Don’t discard your naked zest fruit…save them to use for juice. naked fruit stored in your fridge will last for several days. 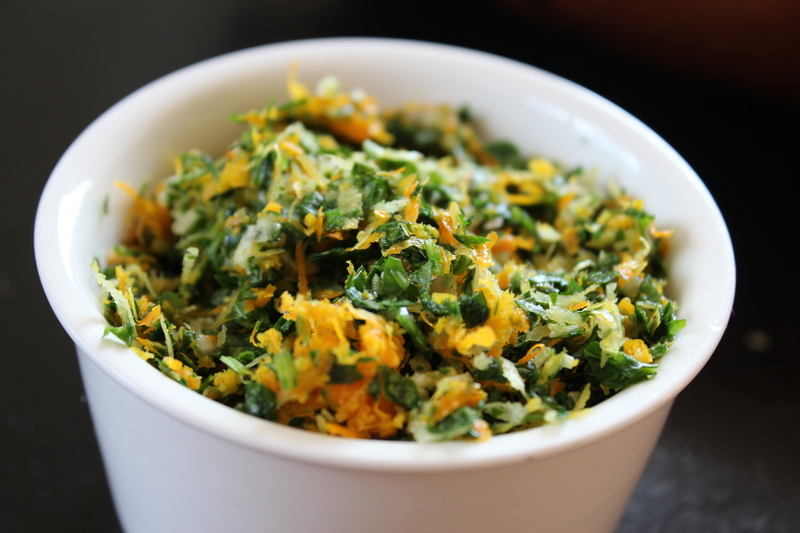 Gremolata can be covered and stored in the fridge for up to 1 day. 1) Choose a delicate, lean protein — fish, shellfish, chicken breast or tofu. 2) Select the most flavorful, colorful, piquant, aromatic garniture you can — capers, olives, ginger, herbs, shallots, lemon zest. 3) Size matters — thinner slices of protein work better, smaller pieces of garnish cook faster. Avoid huge thick chunks of anything. 4) Seal your package properly — do not let any of the precious steam escape from inside the package. 5) Rub a small amount of oil on the OUTSIDE of the package — this contributes heat delivery and makes the roasting environment hotter. In the time it takes for your oven to reach the correct temperature (400°F), you should have your papillote package dressed and ready to go. Then, it’s only a matter of minutes (10 at the most) before it’s cooked, and you’re removing that beautifully glossy, puffy package from the oven to the table! Be very careful when cutting the package open — steam burns are quite nasty! Take a sheet of parchment paper or aluminum foil and fold it in half. Draw a half-heart shape on the folded paper and trim. Open the heart and place the salmon in the center of one side of the heart. Season with salt and pepper. In a small bowl, drizzle the olive oil over the aromatics and vegetables and toss together, season with salt and pepper. Place the vegetables on top of the salmon. Fold the other half of the heart over the salmon and begin to fold the edges together. Start at the curved end of the heart, making one folded crease 1/4-inch from the edge. Continue to make successive folds along the edge of the package, making each new fold from the center of the previous one. Keep folding along the edge, making sure each crease is flat and straight. When you reach the pointed end, fold up, then fold back, tucking it underneath the package. Transfer the package to a baking sheet or any pan and drizzle a couple of drops of oil over the top. Use your fingertips to spread the oil over the surface of the package and bake for 10 minutes, or until the package is browned and puffy. Remove from the oven and let it rest for a minute or two. It will start to deflate. Carefully cut around the edges to open the package. Lift the salmon up from the package and transfer to a plate. Spoon the vegetables and any sauce drippings from the package on top. Serve immediately.